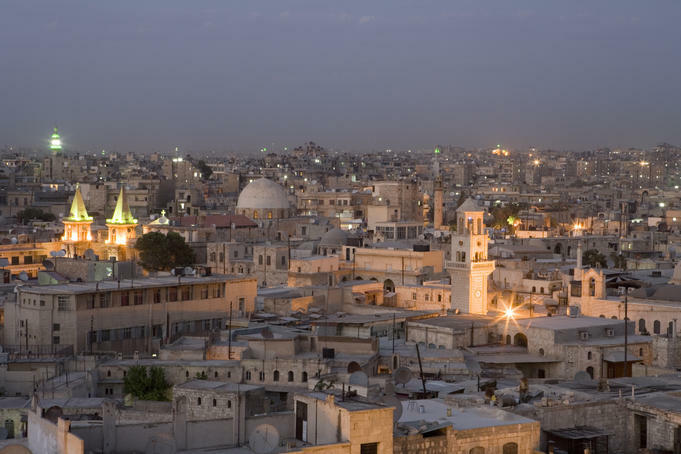 Damascus, capital of Syria. Photo credit, James Gordon, Los Angeles, Creative Commons license via Flickr. Seems like just yesterday the United Nations and the world population appealed to the good sense of Washington … and then learned it had none. Good sense, that is. Today I feel as if we’re watching a sorry remake of Groundhog Day, except, unlike Bill Murray’s character, there is very little we can do to alter the foretold consequences. We’re trapped in a badly broken political system. If not Syria this week or this month or this year, it will be next week or next month or next year. And if not Syria, it will be Iran, Lebanon or North Korea, or some other “threat” that needs eliminating. 1. Washington does not listen and respond to the general tax-paying public or world at-large. From my experiences and reporting it listens and responds foremost to deep-pocketed political donors and their lobbyists, e.g., Wall Street and K Street. 2. Wall Street and K Street are motivated primarily by self-interest and cannot be trusted by the general public in the United States or abroad. Why? The U.S.-Congressional Military Industrial Complex produces profits for the wealthy and jobs for key political constituencies. With those come job security for politicians and beach homes for the wealthy. 3. Washington has become a country club for Wall Street and K Street, and it is today a (willing) tool for repeated schemes of greed and deception. 4. This latest deception is no different than many others, e.g., the invasion of Iraq. The script depicts good-guy Washington standing on moral ground threatening to bomb an “evil” dictator because of unproven allegations. Yes, that’s redundant. For a reason. I’m stressing this point: These charges are unproven. 5. After dropping hundreds of thousands of tons of bombs and ammo (many with depleted uranium) onto Iraqis (see HERE a declassified military count of just the first 30 days of the war), the only place Washington can successfully pretend to be moral is in the eyes of the U.S. media and electorate. The rest of the world knows better, especially citizens of the Middle East. To a person, every Middle Easterner I’ve ever interviewed is dumbfounded by Washington’s ability to fool its electorate again and again. (Remember, Dubya was reelected after botching the invasion/occupation of Iraq.) Yet, here we are. Again. Hooah! Go ‘Merica. Support the troops! We’ll be watching on CNN. 6. Twelve years ago when Washington ramped up its role as Middle East protagonist the stock dividends of the top five U.S. “defense” (aka war) contractors ballooned, e.g., Lockheed Martin’s per-share stock dividends increased 680 percent between 2001-2011; General Dynamics’ 336 percent; Boeing’s 250 percent; Northrop Gruman’s 250 percent; Raytheon’s 190 percent. (Those numbers are from my reporting in “The Gospel of Rutba: War, Peace, and the Good Samaritan Story in Iraq.”) And, evidently, the war biz is still thriving. Read (HERE) a September 2013 report on record high profits and stock prices for U.S. military contractors. 8. This comfy arrangement will remain intact indefinitely because it enables the rich to get richer (aka Wall Street and K Street) without the majority of the U.S. electorate having to worry about their sons and daughters dying in a far-off desert or coming home with PTSD. Meanwhile, the 99 percent of us who didn’t wear a military uniform during the last decade are too busy paying bills and/or managing our beach homes to give much attention to the Washington-Wall Street profit schemes. 9. Unless the United States reinstates a military draft — thereby forcing the overall electorate to examine the real motives that drive Washington’s warmongering — American military aggression will continue to spread regardless of the opinions/advice of the United Nations and the world at-large. Congress knows this. Therefore, I don’t anticipate the reinstatement of military conscription. Washington hasn’t used it since 1973. 10. I suspect Washington’s outrage about chemical weapons isn’t about dead Arab civilians or Syrian President Bashar al-Assad. Tens of thousands of civilians in Iraq and Afghanistan have been killed by the U.S. military. In Iraq, the Pentagon claimed it wasn’t even keeping score. Washington’s shock and outrage over Syria is more about theater. War’s theater, specifically. (Ever read Naomi Klein’s “Shock Doctrine“?) Washington wants to get at Iran, Hezbollah, etc. To repeat, these allegations leveled at al-Assad’s regime are just that– allegations. It seems plausible that outsiders (the Mossad? Rebels? Terrorists?) could have deployed the Sarin gas in order to draw history’s mightiest and most gung-ho military deeper into the conflict. FOR MORE PERSPECTIVE ON WAR & PEACE, see the last minute of Greg’s speech in Boston HERE.